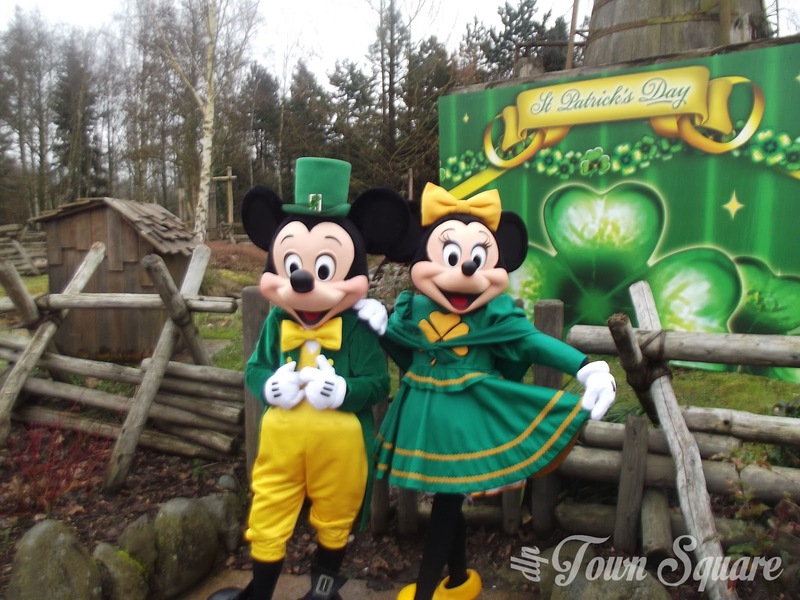 For some years now, Disneyland Paris has put on extravagant celebrations for the national holidays of St. Davids and St. Patrick’s day, as well as for the annual bonfire night celebration. Compared to these holidays, the national holiday of France is the least well observed, passing with a simple five-minute firework display. St. Patrick’s day was marked by Mickey, Minnie, Chip and Dale in a Irish dress as well as short shows featuring traditional Irish dancing and music (despite the pipe band being from Scotland!). Disney Magic on Parade was extended with a pre-parade and the day ended with a spectacular firework show using Disney Dreams! projection technology and Disney music with a Irish touch. Disney Village also featured a few Irish themed shows in Billy Bobs. St. Davids Day was marked by a Welsh market in Disney Village, whilst Disneyland Park featured similar events to its Irish cousin, such as the characters in Welsh dress, a pre-parade and fireworks. We were particularly impressed by Bonfire Night in Disney Village, which was an impressive twenty-minute firework display around Lake Disney directly following Disney Dreams! There is no doubt that Disneyland Paris celebrates these nationals holidays very well, most likely to attract these guests to the resort. However, Bastille Day (14th July) is not particularly celebrated in Disneyland Paris. Bastille Day is essentially the French national holiday in celebration of the storming of the Bastille prison. For the last few years the only sign of it being celebrated in the park is the five minute firework display, without Dreams! projections set to traditional French music (Such as Boum! by Charles Trenet). In the United States, Disney World and Disneyland celebrate their national holiday with limited edition merchandise, a pre-parade, street decorations and an extraordinary firework spectacular! Would these Disney Parks get away with not celebrating Independence Day? American guests would not accept such an oversight by Disney parks management. So why was the 14th July not celebrated? Perhaps due to the parks already hitting capacity every year on the holiday and so Disney management has decided not to add more so as not to attract even more guests. Perhaps as Disneyland Paris is close to the major celebrations in Paris and the celebrations taking place in every town and village across the country (including those just 10km from the parks), management decided that putting on ‘traditionally French’ events was not worth the expense. What is certain is that a 14th July celebration could be done reasonably cheaply by involving the Disney Music Days program with local schools to perform on stages across the park. The local community would make the day feel more special, and Disneyland Paris betters its community relations. This scenario really is a win-win. What is your opinions on national holidays in the Disneyland Paris parks? Perhaps you are reading from a country where you would like your national day celebrated? Tweet @dlptownsquare or comment below. Thanks to @CafeFantasia @parcorama and @dedicatedtodlp who started this debate on twitter and inspired me to write this article. Go follow them, they tweet fantastic Disneyland Paris content each day! Is Disneyland Paris an innovator?